Used to show a list of Articles that have been Archived and can be searched by date. Archived articles are no longer published but are still stored on the site. Articles are Archived using the Article Manager screen. Note that Articles assigned to the "Uncategorized" Section will not show on the Archived Article List layout. Parameters - Basic This Menu Item Type Archived Article List allows you to set the sort order of Archived Articles, as shown in the screenshot below. The Default order is most recent first. 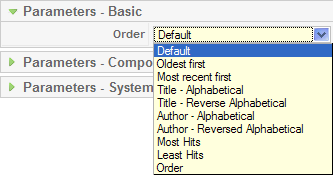 The Order option sorts Articles by the Order column in the Article Manager. This page was last modified on 13 July 2010, at 09:41.